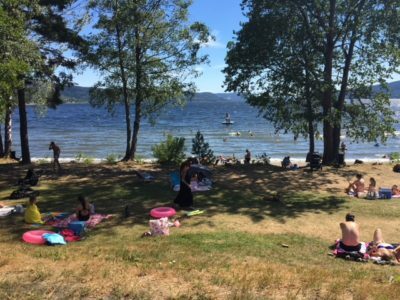 Summer arrived in May in Southern Norway, and its record high temperatures have stuck around ever since. The initial joy of blue skies and sunshine, day after day, now seems to be wearing off, replaced by complaints and concerns over a drought that’s affecting more than just the farmers. Grass turned yellow and brown weeks ago, many of Norway’s bountiful birch trees are already turning gold and brown and dropping their leaves, wild berries have dried up before they even ripened enough for picking, and now the late summer and early fall wild mushroom season is threatened, too. They need lots of moisture, but local forests are tinder dry. “Thank goodness for the pine trees we have around our hytte (holiday cabin),” Skou added. At least they provide some shade with temperatures hovering around 30C (85F), but they’re also in danger of burning up at the slightest spark or bolt of lightning, in a summer where scores of forest fires have been breaking out every day. Skålin noted that more than 100 official weather stations in Norway set new records for high average temperatures in May and June. Around 80 stations set new records for maximum temperatures of more than 30C. It was even extremely warm in the mountains, with even the high peak of Juvasshøe in Oppland County, at an altitude of 1,894 meters over sea level, setting a warmth record. It was “only” 16.2C, Skålin noted, but that’s high indeed considering its location at such northerly latitude. “Then it’s appropriate to note that a united corps of climate researchers have said for many years that global warming will be greatest in the northern areas,” Skålin wrote. Skeptics have found comfort in noting how last winter was record cold with lots of snow, while previous summers featuring lots of rain and wind and flooding have also been blamed on climate change. Researchers Rasmus Benestad and Jostein Mamen maintain that when the intensity of heat waves all over the world increase, as they have this year, it’s a consequence of global warming. Norwegians complaining about temperatures in the low 30s may seem to be whining, given the higher intense heat in other areas around the world, but residents of the Nordic areas simply aren’t accustomed to such a lengthy spell of hot weather nor are they equipped for it. Homes, many offices and stores lack air conditioning, farmers lack sprinklers or irrigation systems, and now even the groundwater levels are declining in a country that generates most of its power from hydroelectric plants. Many Norwegians have been suffering from a lack of sleep and energy in the warm weather, while warning have been issued that elderly people are the most vulnerable to dehydration and a lack of appetite in the warm weather. While all the forest and brush fires have posed the biggest threat, and even resulted in the death of one fire-fighter from Eidsvoll last week, the farmers stepped up their calls for state help as they face shortages of feed for their livestock. With emergency slaughtering of herds already underway, radio station P4 reported this week that depressed farmers have also been calling crisis lines in desperation. “Many farmers say they can’t sleep at night,” Halle Arnes of the agricultural service agency Norsk Landbruksrådgivning told P4. “They have emotional relations to their animals, have taken care of them and raised the herds since they were small.” With feed prices skyrocketing for those who can get it, horse owners are also faced with having to slaughter animals. As in most any crisis, some are profiting from Norway’s long hot summer so far. Prices for shrimp have jumped from less than NOK 100 per kilo to as much as NOK 300 per kilo, as demand outstrips supply. Bans on outdoor grilling because of the drought have also left many eating more cold seafood, also because it’s too warm to cook in the kitchen. Tent sales have also shot up this summer, as more and more Nowegians flock outdoors to sleep. That’s part of a bigger trend, though, as the great outdoors becomes increasingly attractive also to younger generations. Membership in organizations like Skiforenening and the national trekking association DNT has been setting records for several years. Everyone needs to be extra careful in the hills, mountains and forests this year, though. Norway’s state directorate for public safety and preparedness (DSB) has declared that it will need to rain for several weeks before the fire danger is over. There were some more drizzles in Southern Norway and in and around Oslo on Wednesday, but not enough to relieve the drought. As of Thursday mid-day, there was no rain in the weather forecast for at least the next week ahead.